Congratulations to Professor SAW Swee Hock, the Founding Chair of SAAS, on being conferred the Honorary Doctor of Letters by National University of Singapore (NUS). Honorary Doctorates are the highest accolade of NUS. 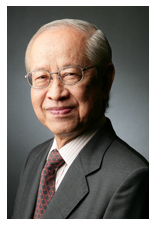 Professor Saw was presented the honour as recognition of his significant contributions in the field of Statistics, in advancing tertiary education in China and other countries, and his outstanding philanthropic efforts. Professor Saw is currently an Honorary Professor of SAAS and he was awarded the HKU Honorary University Fellowship in 2013. As the Founding Chair back in 1969, Professor Saw led the Department through the early days of developments, and together with the concerted efforts of staff and students, enabled the Department to rise to its current height. Professor Saw’s support for SAAS continued even after he left for his home country. He donated a generous sum of HK$300,000 to set up a scholarship at the University in recognition of the academic achievement of B.Sc. graduates whose first majors are in the SAAS. The Scholarship is awarded to at most two students on the basis of academic merit every year. Last but not least, SAAS would like to take this chance to thank Professor Saw's unfailing support to the developments of the Department throughout all these years.